A.P. Moller-Maersk Group has entered an agreement with AT&T to use its Internet of Things (IoT) technology to connect its refrigerated containers. In what is reported to be one of the largest industrial IoT deployments of its kind, Maersk is working with AT&T to track and monitor the condition of refrigerated containers with perishable goods. Maersk has connected more than 290,000 of its refrigerated containers to the AT&T network. Each unit uses a remote container device (RCD) that has a 3G High Temperature SIM card, a GPS unit, a ZigBee radio and antenna and multiple interfaces for connecting into the refrigerated container's controller. The RCD can operate with two-way connectivity from just about anywhere in the world. Before, onsite supply chain managers would manually check the condition of each container. 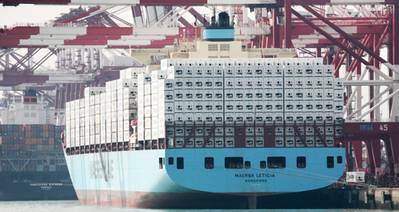 Now, Maersk has near-real time visibility into the conditions of each refrigerated container at almost any part of its journey during the supply chain. Shipping supervisors can monitor mechanical performance to help ensure the equipment is in proper working condition. "Every day we're responsible for shipping perishable goods around the world," said Maersk Line's Vice President and Head of Assets & Deployments, Amdi Krogh. "AT&T's technology helps us improve the level of services we provide, helping ensure they are optimized and arrive in the proper condition – no matter the length of the journey."